The calendar is important for both Medieval and earlier Celtic cultures, not only in terms of feast days and holidays but in terms of seasonal changes and consequent changes in appropriate activities and labor. The association between season and labor is exemplified in Irish Brehon law, Medieval Irish and Welsh tales, and in Medieval Books of Hours and Christian festivals and holy days. The Neolithic residents of Ireland and Britain built stone structures like Stonehenge, and Brúgh na Bóinne which was constructed so that dawn marks the Winter solstice inside the passage tomb at Newgrange. In the later Iron age and Medieval eras, we have not only early manuscript references to the four major Celtic feast days of Samain (Modern Irish Samhain), Imbolc, Beltain and Lughnasa, we have fragments of Gaulish calendars, most notably the Coligny calendar. By the time of the Medieval era, the use of a calendar to track the time is clear in references to specific days and dates in the Irish Annals, references to feast days in Medieval Irish and Welsh tales and laws, as well as in the calendars created and used by the church, most notably in the calendar pages of books of hours. 2. And cwaédon, Hwær ys se, Iudea cyning ðe ácenned ys? sóþlíce we gesáwon hys steorran on east-daéle, and we comon us him to ge-eadmédenne. 3. Ðá Herodes ðæt gehýrde ðá wearþ he gedréfed, and eal Hierosolim-waru mid him. 4. And ðá gegaderode Herodes ealle ealdras ðæra sacerda, and folces wríteras, and áxode, hwær Crist ácenned waére. 6. And ðú, Bethleem, Iudea land, wítodlíce ne eart ðú læstþ on Iuda ealdrum; of ðé forþ-gaéþ se here-toga, se ðe recþ mín folc Israhel. 7. Herodes ðá clypode on sunder-spraéce ða tungel-wítegan, and befran hí georne hwænne se steorra him æteowde. 8. And he ásende hí to Bethlem, and ðs cwæþ, Faraþ, and áxiaþ geornlíce be ðam cílde, and ðonne ge hyt gemétaþ, cýdaþ eft me, ðæt ic cume and me to him gebidde. sóþlíce! se steorra, ðe hí on east-daéle gesáwon, him befóran férde, oð he stód ofer, ðær ðæt cíld wæs. [hig] fægenodon swýðe myclum gefean. brohton, ðæt wæs gold, and récela, and myrre. Before discussing the May from the Golf Book, I’m going to be lazy, and link to a post from two years ago about May day and May calendar images from books of hours. 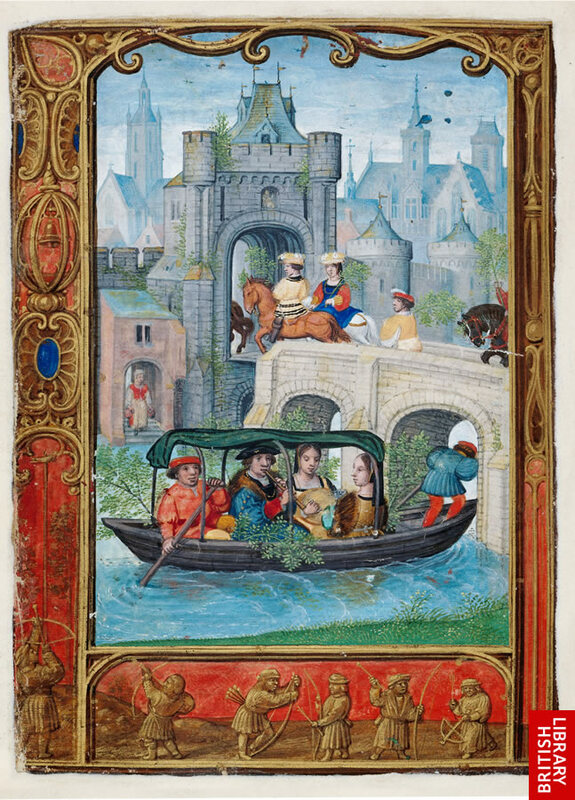 This calendar image from a book of hours is an image of a Maying boat expedition. This page showing May from the Golf book is an image from the British Library’s manuscript Additional 24098 folio 22v. This May calendar image is from a sixteenth century book of hours from the Netherlands workshop of Simon Bening and better known as The Golf Book . The image shows a characteristic aristocratic Maying scene in its depiction of a spring landscape (Bening is known for his landscapes), with green leaves, and branches of greenery in the boat. You’ll note there’s a lutenist, and a pipe player in the boat, presumably performing a Maying song or May carol. There appears to be an additional Maying party on the bridge above. The style of the images in The Golf Book is very similar to that of panel paintings, and more “painterly” than is usual in earlier illuminated manuscripts, and typical of Bening’s workshop. The Golf Book is a partial ms. that consists of calendar images, similar to those in other Books of Hours, with an emphasis on leisure rather than seasonal labor. It is particularly well known for the miniature border images showing people playing games (like golf—The Golf Book has a calendar page with a scene at the bottom showing people playing a game like golf, hence the title). You can see other images from The Golf Book here and here, in a calendar scene for June, showing jousting. Some medievalists may be particularly interested in the toy windmills, or in the spectacles visible in this self-Portrait of Bening. I know, I’ve said it all before. France, Rouen; c. 1500 for June is a typical June image. The Bibliotheque National NF, Lat 18104, fol. 3v, John of Berry’s Petites Heures, France, Paris 14th Century, for the month of June Shows Saint Paul preaching to the Philippians, the Church personified, and at the top, the symbol for Cancer, this time very clearly a crab. Long before May 1 became associated with workers, it was associated with the joys of spring and the restoration of fertility to the land. The Celtic festival of Beltaine (Modern English Beltane) is the ancestor of the calens Mai, or May Day associated with May 1, and I suspect the Roman floralia may have contributed or shared an common IE ancestor. Beltaine is one of the four main Celtic seasonal festivals, and as a liminal time, between the death of winter and the birth of the warm half of the year, it is one of the occasions when the barriers between the mortal world and the otherworld are easily passed (Rees and Rees, 1961, 89-90). Perhaps because the Celts counted the passing of time in “nights,” the rites of May often begin on May Eve, April 30. These rites, typically an expedition at dawn on May 1 to “bring in the May” or Hawthorne, are often preserved in some form in the Medieval manuscripts called Books Of Hours, which served as both a calendar and a collection of the psalms and scriptures and prayers to be used on a given day throughout the year. Calendar pages, featuring the zodiac symbol for the month and a depiction of labors or pastimes associated with the month and a list of the local feast days and saint’s days, are a standard feature in Books of Hours. The image at the top is from the May calendar page from the Très Riche Heures of Jean Duc du Berry, and was painted by the Limbourg brothers sometime between 1412 and 1416. The image above is from the lower portion of the calendar page for May; the top shows the zodiac symbol for Gemini and the astrological position of the sun. This labor for May shows the May jaunt, a semi-formal promenade by the aristocrats celebrating the “joli mois de Mai.” You’ll note that the participants are dressed in green, the “livree de mai.” The woman in green in the middle foreground has a headdress decorated with green leaves, perhaps freshly gathered that morning. There are, as I mentioned, many literary references to May Day, or Beltaine, and the custom of Maying. In the Celtic tales, the emphasis is on fertility and the accessibility of the Otherworld. In the first branch of the Welsh Mabinogi , Teyrnon, a former man of Pwyll’s, the lord of Dyfedd, is troubled every May eve by the mysterious disappearance of the new-born colt of his best mare (Ford 1977, 52). One of the three plagues in Lludd ac Llefelys is a scream heard every May Eve. In Culhwch ac Olwen Gwythyr ap Greidawl and Gwyn ap Nudd fight every May Day until Judgement Day. The winner on Judgement day will have Creidylat uerch Lud Law Ereint to wife. Beltane or Beltaine (OI) is important in Irish myth as well, though the Irish seem to have favored November 1, or Samhain (OI Samain) a bit more. The tales Scel na Fir Flatha, Echtra Cormaic i Tir Tairngiri ocus Ceart Claidib Cormaic begins at dawn on ceitemain or May 1 in Tara when Cormac makes a rash bargain with Manannan mac Lir that results in the loss of his entire family to the otherworld intruder and god of the sea. King Ailil is killed on May 1 while meeting with a woman behind a hazel bush (Rees and Rees 337), an activity that we will see is frequently indulged in on May day even hundreds of years later. You may sometimes see the Gemini, the twins associated with May via the astrological symbol on most calendar pages in books of hours, looking as if they might be fornicating behind a bush (and yes, sometimes they”re both sexes, sometimes both are male). In an Irish version of “Tam Lin” the fairies ride on the “first of May.”1). Edith Wheeler. “Irish Versions of Some Old Ballads.” <cite>Journal of the Irish Folklore Society</cite> I 41–48; 47. Collected from the singing of Ann Carter. URL ML 5 I68 v. 1-10). In Malory’s “Launcelot and Guinivere” the queen is kidnapped by Mellyagaunce as she rides out on a Maying expedition, dressed all in green, “uppon the morne or hit were day, in a May mornynge” (Vinaver 1990 1120). The Middle English lay of Sir Orfeo and the associated Child ballad “King Orfeo” both have Herodis “taken” by the fairies “in the comessing of May” . In Robert Henryson’s Orpheus and Eurydice Euridice “walkit furth in till a Maii mornyng” and was “with the fary tane” when she steps on a serpent “with that the quene of fary / Claucht hir up sone and furth with hir can cary” (Fox 1981 ll. 93; 119; 125-26). Shakespeare, picking up on references to May Day in Chaucer’s Knight’s Tale, used them in A Midsummer Night’s Dream. Against May, Whitsunday, or other time, olde men and wives, run gadding over-night to the woods, groves, hills and mountains, where they spend all night in pleasant pastimes; and in the morning they return, bringing with them birch and branches of trees, to deck their assemblies withal. . . . But the chiefest jewel they bring from thence is their May-Pole, which they have bring home with great veneration. . . . They have twentie or fortie yoke of oxen, every oxe having a sweet nose-gay of flowers placed on the tip of his hornes, and these oxen drawe home this May-Pole (this stinking Ydol, rather), which is covered all over with floures and hearbs, bound round about with strings, from the top to the bottome, and sometime painted with variable coulours, with two or three hundred men, women and children following it with great devotion. And this being reared up . . . then fall they to daunce about it, like as the heathen people did at the dedication of the Idols, wereof this is a perfect pattern, or rather the thing itself. I have heard it credibly reported (and that viva voce) by men of great gravitie and reputation, that of forty, threescore, or a hundred maides going to the wood over-night, there have scarcely the third of them returned home againe undefiled. But perhaps the finest expression of the Rites of May we have is that in Herrick’s delightful Corrinna’s Going A-Maying. 1. ↑ . Edith Wheeler. “Irish Versions of Some Old Ballads.” <cite>Journal of the Irish Folklore Society</cite> I 41–48; 47. Collected from the singing of Ann Carter. URL ML 5 I68 v. 1-10).